MAXinBOX 16 Plus Multifunction actuator. 16 x 16A outputs C-Load. Multifunction actuator. 16 x 16A outputs C-Load. 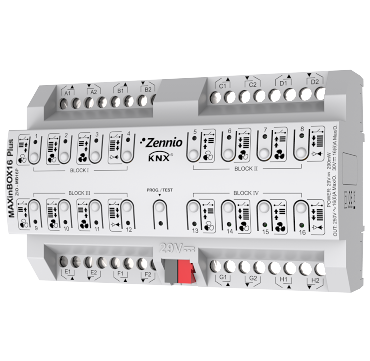 MAXinBOX 16 Plus is a multifunction actuator for DIN rails that offers multiple configurations of up to 8 shutter channels, up to 16 independent outputs of 16A (capacitive loads supported) and up to 4 blocks of 2-pipes fan coil controller. It allows manual control of its outputs thanks to the push buttons on the cover. It includes 20 independent logical functions. 8 DIN rail units. Update ETS4/ETS5 with the last version to be able to import the product.